Lefteris is a Lead Software Engineer at ZuluTrade and has been responsible for re-architecting the backend of the main website from a monolith to event-driven microservices using Java, Spring Boot/Cloud, RabbitMQ. He has extensive work experience for over 10 years in Software Development, working mainly in the FinTech and Sports Betting industries. Prior to joining ZuluTrade, Lefteris worked as a Senior Java Developer at Inspired Gaming Group in London, building enterprise sports betting applications for William Hills and Paddy Power. He enjoys working with large-scalable, real-time and high-volume systems deployed into AWS and wants to combine his passion for technology and traveling by attending software conferences all over the world. 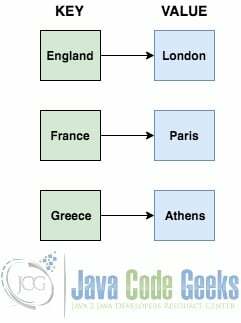 A very important data structure in programming is the Map which is used for extremely fast lookups. In this post, we will take a look at two implementations of the Map data structure in Java, the HashMap and TreeMap classes. The main difference between those two implementations is that the HashMap offers better lookup and insertion times but does not preserve the insertion order, whereas the Treemap is slower but does preserve the insertion order. We will compare the most commonly used methods and their complexity, provide code examples and measure their performance. The HashMap and TreeMap classes that we will see in this post reside in the java.util package and they both extend the AbstractMap class which implements the Map interface. They are part of the Java Collection Framework.. The HashMap class is the most widely used implementation of the Map interface. It permits null values and one null key and it makes no guarantees as to the order of the map. In particular, it does not guarantee that the order will remain constant over time. The implementation stores key-value pairs in a hash table, which is an array of linked list, also called buckets. The hash table uses a hash function to compute an index of the key and store the value into the appropriate bucket. The hash function should be implemented in a way to disperse the elements properly among the buckets otherwise the lookups will be slow. When the number of elements in the hash table exceeds a specific capacity, then the hash table grows and is rehashed. To achieve better performance in a HashMap we should know the initial size of the map and provide it to the constructor. Below we create our own custom implementation of a HashMap that stores the key-value pairs in an array of linked list entries. In the above class, we provide a very basic implementation of the HashMap and the put(String key, String value), remove(String key), get(String key) and containsKey(String key) methods. The HashMap uses under the hood the buckets which is an array of singly linkedlist nodes, the Entry objects. The most important method of this class is the hash(String key) method, which calculates the index of the key and stores the Entry object into the appropriate bucket. In this implementation, for simplicity, we do not provide any bucket resize and rehashing. Let’s run the main method which invokes all those methods and see the output. In the above output, we initially print the HashMap and we specify in which index each linked list belongs to. Then we call the get(String key) method for an existing and a non-existing key. After that, we remove one existing and one non-existing key from the map and finally we print the map again which results in a different output. The TreeMap class is a Red-Black tree based implementation, which is a self-balancing Binary Search Tree. The map is sorted according to the natural ordering of its keys, or by a Comparator provided at map creation time, depending on which constructor is used. Below we provide an example of how to create a TreeMap using a Comparator. In the above example, we create a Comparator which sorts the Role objects based on the hierarchy field and then we randomly add items in the TreeMap object. Let’s run the main method and see the output. In the above output, the objects that we randomly added in the TreeMap are indeed sorted. The HashMap provides O(1) constant time when putting, removing and getting entries from the map. When the HashMap requires rehashing then the put method takes O(n) time. It is very important to provide hash functions which disperse the elements properly among the buckets, otherwise, the get operation will run worst-case in O(n) time, as it would have to loop big linked lists. On the other hand, the TreeMap provides O(logn) time for all those methods, as it uses a Red-Black tree under the hood. In the above class, we initialise a new HashMap and TreeMap objects and we add 1 million elements. Then we invoke the put(String key, String value), get(String key), containsKey(String) and remove(String key) methods and print the time each operation takes. Let’s see the output and verify the time complexity of the methods. In the above output, we confirm that all the methods of the HashMap are faster than the TreeMap as far as time complexity is concerned. The HashMap and TreeMap classes should be used in different use cases as they provide different memory consumption, performance and functionality. The equals and hashCode methods that every class extends from the root Object class are very important when it comes to maps. The contract between equals and hashCode, is that if two objects are equal, then they must have the same hash code, however, the opposite is not always true. The hashCode method should have an implementation which disperses the elements properly among the buckets. Let’s see below an example of a good and a bad implementation of the hashCode method and compare the times for the put and get operations. return 10; // DON'T DO THAT !!! In the above example, we create the GoodHashcode class which has a good implementation of the hashCode method as it uses the id which is a unique number. Additionally, we create the BadHashcode class which has a bad implementation of the hashCode method as returns the same number for any object created. That would put all the objects in the same bucket and it would create a big linked list. Let’s run the main method and see the time it takes to put and get all the items of the two maps. From the above output, we confirm that a good and a bad implementation of the hashCode method result in a huge difference in time complexity. The HashMap and TreeMap classes are not synchronized and should not be used in a multi-threading program. If multiple threads access the lists concurrently, and at least one of the threads modifies the list structurally, it must be synchronized externally. A structural modification is any operation that adds or deletes one or more elements, or explicitly resizes the backing array. In order to synchronize both classes, we can use the Collections.synchronizedMap(map) method. This is best done at creation time, to prevent accidental unsynchronized access to the map. In this post, we compared the most commonly used methods of the HashMap and TreeMap and provided code examples. We measured the time complexity and performance of those methods and saw that as best practice we should avoid using those classes in a multi-threading environment. We also took a look at the importance of the equals and hashCode methods for any map implementation.